Greetings from Kenya in the precious Name of our Lord and Saviour Jesus Christ. We trust that you are well in the Lord. Our service in the Lord is sustained by God’s grace through your prayers and support of love. Here are some updates of the Lord’s work here on the field. The academic term began with 106 students and the term ended with our 45th graduation ceremony on November 28 (pictured above). 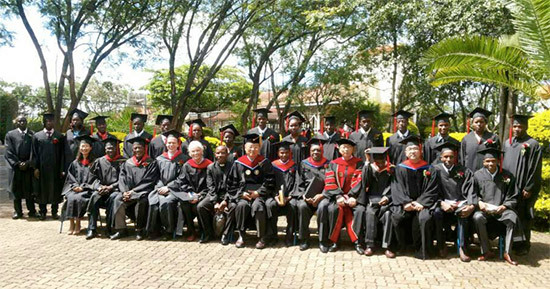 We praise God for 16 who graduated and have now left to serve in their ministries. The number of graduates is the lowest that we have had in recent years, and if we consider the fact that this class began with 46 students four years ago, it is clear that many along the way discontinued their studies. Please be in prayer for the 16 who have persevered to be more equipped for the ministry that the Lord has given. Please join us in prayer that God enables them to respond with obedience to whatever and wherever they are called and that they will be used as effective instruments for the saving of souls. We are grateful to Glory BP Church in Virginia (Senior Pastor Young-Sun Hwang) for their longstanding tradition of gifting the graduates with a KJV study Bible every year. We praise and thank God for their remembrance every year and their sacrificial giving and love. May the Lord provide for their needs. We ask for your special prayer for a student (Kennedy Ruhosha) who joined last term as an auditing student. He is a gifted and capable individual who once worked for the Rwandese government but lost everything due to drug addiction. He accepted the Lord as Saviour at a rehabilitation facility and was led to our school. It is our hope that he will complete his studies according to God’s will and that God will prepare him for an effective ministry. Korea through the generous giving of Calvary Pandan BP Church and Severance Hospital in Seoul. Following successful surgery (tumor removal), he recovered his sight but had been advised with many precautions (e.g., drinking of purified water only). 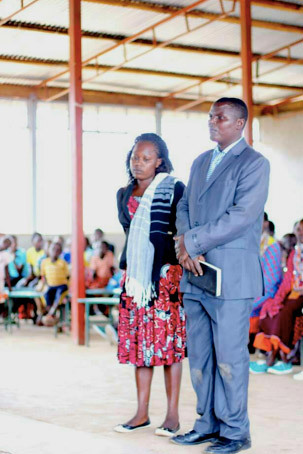 Despite our suggestion to relocate to Nairobi where the environment is less physically taxing and medical care is readily available, Pastor Omweri has opted to continue serving among the Maasai (he himself is of the Kisii tribe). The ordination service was packed with church members who witnessed this wonderful occasion. I believe we were all encouraged by Pastor Omweri’s resolve through the years and glorified God who graciously moved our hearts during the service. Please pray with us for Pastor Omweri and his ministry. May the Lord grant him good health also (he is on lifelong medication and must monitor his health closely). We look forward to greeting you again. We pray that this Christmas season will be a time of special grace for you and that the New Year will inaugurate a blessed season of deeper fellowship with our Lord.